A Time to Stitch 7 Embroidery Challenge – Reveal! Hello, friends! It’s time once again for another Time to Stitch challenge from Christine and Therese! 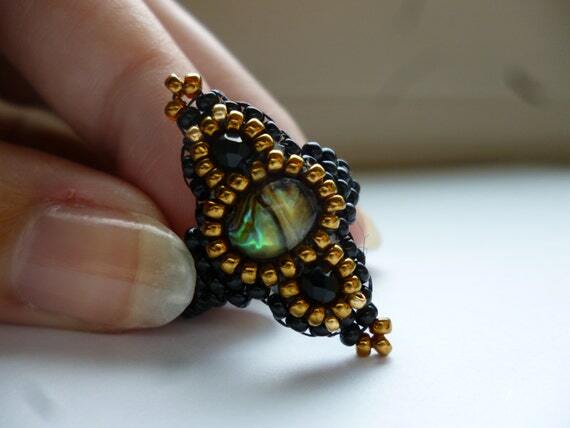 This time the challenge is to explore bead embroidery! I have some experience with bead embroidery, but it definitely a weak spot in my beadweaving arsenal. Generally, I find that my stitching ends up looking kinda sloppy and I am TERRIBLE about keeping things symmetrical. Here are a few examples of embroidery pieces I have made in the past. They’re certainly not awful, but they’re just a bit… messy for my taste. The freeform construction of these pieces are completely counter intuitive to me. Off-loom beadweaving, which I almost exclusively do and write patterns for, is like building with Lego blocks. It’s construction and building and fitting shapes together. 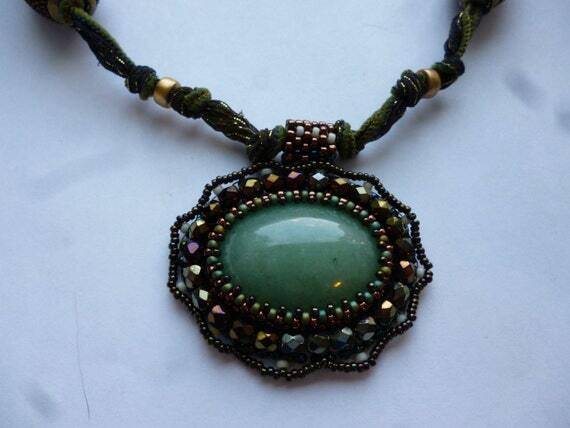 Bead embroidery is more like painting or sketching, both things that I have never been any good at. But what better way to practice and improve than with this ATTS challenge? I ended up making a hair barrette with some leftover cabs I found in my stash. I want to say that the pink stones are Rhodonite, but I have no clue about the pale green stone in the center. I’ll admit, I’m a little embarrassed to post pictures of this piece, because it really isn’t up to my standards. The stitching is sloppy and I don’t like how the color scheme ended up. But, like I said, I need to practice if I want to get better. And I am proud of how clean the back of the piece and the barrette look. Usually, I get glue everywhere, but this actually looks nice! So, all in all, it was a learning experience and I am ready to keep trying and improving! In the mean time, check out what the other participants in this challenge have made and be sure to leave lots of comments as you hop from blog to blog! 25. Samantha <- You are Here! 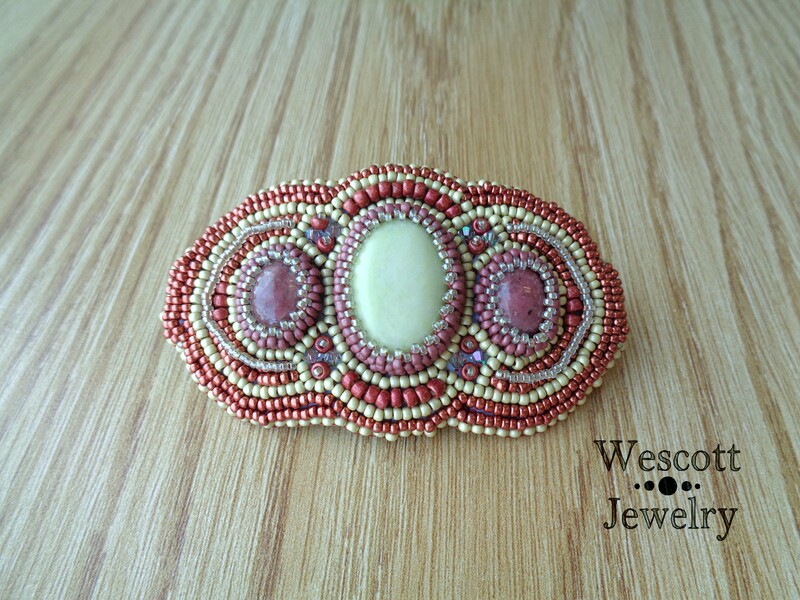 This entry was posted in Challenges and Blog Hops and tagged a time to stitch, art, arts and crafts, atts, bead embroidery, beading, beading patterns, beadweaving, beadwork, blog challenge, blog hop, bracelets, challenge, diy, hair accessories, jewellry, links, wescott jewelry. Bookmark the permalink. 21 Responses to A Time to Stitch 7 Embroidery Challenge – Reveal! All your past endeavors are gorgeous, as is the barrette ~ love your color choices! What you said about this more like painting/sketching and off-loom weaving like legos really stuck me as a truth for me too ~ I just could never articulate it like you did (and i am a terrible painter no matter how much I practice). I have that same discomfort with how wonky my embroidery looks. Yours has very little to no wonk, in my eye. Thanks for being in this one, Samantha! you are way too hard on yourself! and the rope on that bottom right necklace is beautiful! 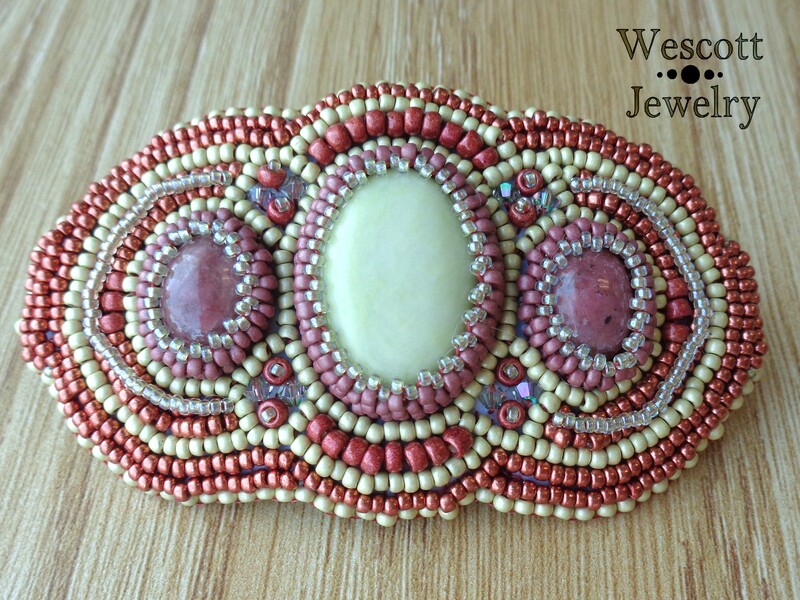 what a stunning barrette and will look gorgeous on! What a lovely idea to make a barrette – makes me wish I had thick, long hair so that I could wear something so pretty. I think you’re being hard on yourself, but I also understand that as artists we always want to make it better, make it perfect. I think anyone who wears this, and anyone who sees it, will appreciate the artistry that went into its creation. Very nice! I think you’re being too hard on yourself. I love the pink and green together. Is the stone in the middle possibly amazonite? I hope you’ll keep practicing! Your past pieces are great and your hair barrette is perfect, it is a lovely piece, the colors are beautiful, and you did a beautiful job. I think all of your pieces past and present are beautiful. I love the barrette it is so pretty with the pink and green cabs. You are way to hard on yourself, your pieces are beautiful. You have great design sense and your color combinations are stunning! I had to smile because we have the exact opposite problems with bead embroidery. It tends to be too regimented for me, and I quickly start wanting to ‘rebel’. Like you, my piece isn’t really up to my normal standards – I can see all of my flaws. But I look at your piece and see something that is truly pretty. Oh my goodness – couldn’t believe it when you said you weren’t happy with your earlier pieces and especially with the barrette. The colors are so fun and fresh and would be a great hair accent for any occasion… well except for going to the gym which would probably ruin it, which would really be a shame. I think you did an awesome job! Well, I love it. I kind of understand what you’re saying though. 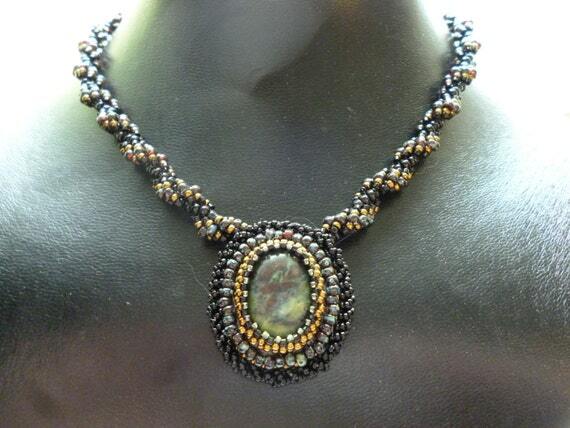 With bead weaving you keep moving down a piece. With bead embroidery you go around and around and you have so much time to stare at the same areas that it will always look to you worse than those of us who only see the whole piece. 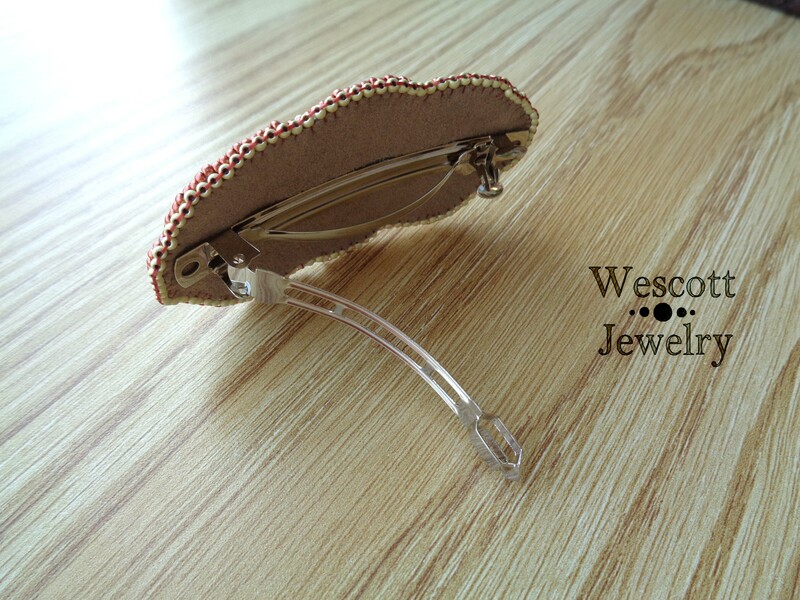 A hair barrette, I wouldn’t have thought of that idea…what a great idea! And your work is great, don’t be so hard on yourself. One thing is to keep practicing…but show us what you do! Thanks for sharing with us! I like it!! The closeup photos are always very revealing (far more so than the naked eye), but I think your barrette ON would be quite gorgeous. Your backing is wonderfully done, for sure. Don’t be so hard on yourself, it looks good to me and those are very closeup pics! I am enjoying your embroidery…sometimes we are too hard on ourselves…when I paint sometimes you need to step back and look again……your work is beautiful. Hi Samantha, Your bracelet is very pretty. You did a good job. I do understand that the artist sees things that others do not. Keep trying because you have a great color and design sense. I liked the analogy that you made.